I want to show off my new handbag again. I did a similar blog post about 18 months ago and nothing much changes really. But do you know what the weirdest thing is? The fact that I've streamlined the contents but increased the size of bag. I need a smaller handbag really but I'm too much in love with the MiaTui to downsize at the moment. My gorgeous MiaTui handbag (see the picture above - you can stroke or lick the screen, it's allowed). Business cards, anti-bacterial hand wash, wide toothed comb, large sunglasses (£1 from Primark), Parker pen, chewing gum, MiaTui minibag which I keep paperwork in, car keys, office keys, house keys. Notebook, HTC phone, clear MiaTui bag (housing roll-on deoderant, cheap emergency lip gloss, Stila lipshine (colour: Traci - great moisturising lippy) and the mirror from my Pink Lining bag), red leather purse (of which the contents are a whole other blog post). Notepad (freebie from Cybermummy - great for idea scribbles on the move), my Filofax (currently using the Personal Spring Green Chameleon), a wallet with extra payment/reward/library cards in, passport (needed for ID at the bank this week after my debit card was cloned). My petrol points card, the paying-in bank book for work, my headphones, a small bottle of perfume, my Open University books (after putting my studies on hold), my aloe vera Vaseline lip therapy, blister pack of paracetamol (used the last one a couple of days ago), small pack of plasters. 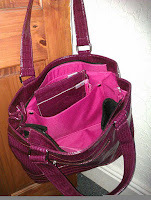 So, what's in your handbag or manbag? If you write about it leave me a link in the comments so I can nip over and have a nosy.